Graham Day Print has been serving customers along the﻿﻿﻿ ﻿﻿﻿﻿south coast including the Channel islands for over 26 years. As one of the leading digital and conventional printers in Southampton we aim to supply our clients with a tailored design and printing service that completely fits their needs, we have all the on-site facilities required. We offer a full range of printing services including business cards, letterheads, price lists, appointment cards, loyalty cards, newsletters, leaflets and brochures to a wide variety of clients. 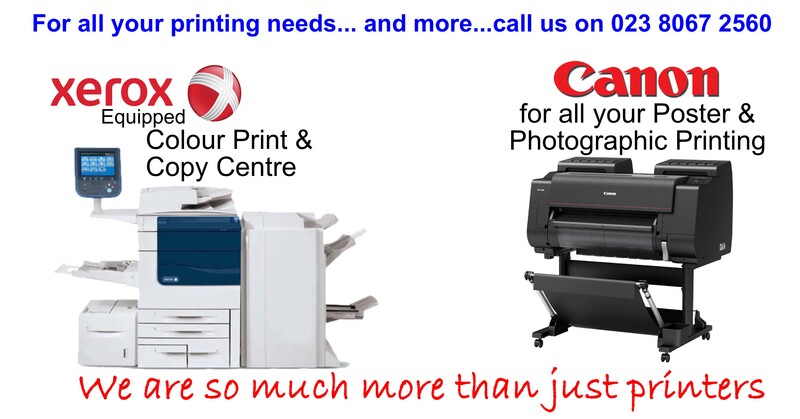 Our Xerox powered print and copy centre is always busy because of the superb quality this machine offers. Our New Canon large format Inkjet printer uses 12 colours to produces high quality Photographs, Canvas prints and Photographic Quality Posters up to A1. This is backed up by our stock of A-Boards, Pavement Signs, Poster Snap Frames and Poster hangers which all continue to be very popular. The range of business card and leaflet dispensers are cost effective and in stock. Roll up Banner Systems are proving to be another winner with our on site Poster lamination completing the service. If you are looking for a very experienced printers to look after all of your printing needs, please call our Southampton office on 023 8067 2560 to speak to a member of our team. With the recent addition of a Fastback Binding system our short run book service is able to produce finished books usually overnight and sometimes while you wait, and short run means ONLY one book if that's all you need. Unlike old style canvas prints these cannot sag as the canvas is stretched over a light weight box, supplied ready to hang.